Undergraduate, postgraduate, doctoral and executive education degree programmes that are part of the University’s range of degree programmes. To carry out continuing education actions. Provide the services available at the UD. Pursue the language courses offered at the University of Deusto and abroad. Process the information obtained in order to hold information session in schools and open days or specific forums or events at the University of Deusto. Manage the forwarding of information relating to the activities and services available at the University of Deusto by physical and electronic means. Prepare preferential profiles and follow-up on activities completed. Data will not be transferred to third parties except in compliance with a legal obligation and/or consent. You can access additional information on the processing of your personal by clicking on the following link (+ info). An eminently practical background, based on case studies and internships in leadinglaboratories. The two degrees with the highest employment rates according to employment agencies. "Los profesores son muy cercanos y que el ambiente entre los compañeros de clase es muy bueno"
Tenemos la opción de hacer prácticas extracurriculares durante la carrera desde los primeros cursos. Yo las estoy realizando en Deutsche Bank y un amigo mío en Mercedes. Tenemos la suerte de que los profesores son muy cercanos y que el ambiente entre los compañeros de clase es muy bueno. Compartes muchas horas con ellos y poder tenerles como apoyo es una ventaja. 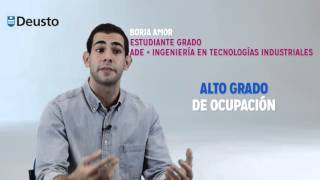 Vitoria-Gasteiz Headquarters | Bachelor's Degrees New!